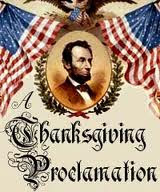 The Civil War was at its height when President Lincoln declared Thanksgiving a national holiday. On October 3, 1863, amidst 50,000 fallen soldiers, destroyed battlegrounds, and an entire population at odds with each other. Recently, the United States has endured several tragedies: hurricanes, large-scale fires, mass shootings, a heroin epidemic, terrorism. Perhaps this year you are struggling to find something to be thankful for. Or maybe this season has always been difficult for you. A brutal war had torn America apart when Thanksgiving was declared, just after the battle of Gettysburg had just been won. A battle that changed the course of American history, paving the way for freedom and democracy. Has God ever called you to give thanks during a season of conflict and turmoil? Dear Lord, help us to practice gratitude in such seasons of our life no matter how bad things look. In the Name of Jesus, Amen.